Automatic wah/quack effect gives a similar effect with the manual version (reference ), but without the need of any pedal to manually control the frequency/tonal sweep. An envelope detector is an electronic circuit that takes a high-frequency signal as input and provides an output which is the envelope of the original signal. An example of a signal and its envelope is show in the figure 2, showing the original signal in the blue plot, and its envelope in the reds. The core function for building automatic wah/quack effect is band-pass filter. This signal processing function produces the effect of sliding vowel as heard in the “wow” or “quack” pronunciation. Figure 3 shows the schematic diagram of second order band-pass filter. The center frequency of this band-pass filter is determined by the value of resistors and capacitors. The advantage of this circuit is that we can shift the center frequency by shifting the value of R2 without changing the characteristic of the gain (the maximum gain value at the center frequency), see reference  for more detail. Figure 4 shows the complete schematic diagram of wah/quack effect, consisting an internal ground reference (U1A), an envelope detector (U1B), an envelope amplifier (U1C) and a modified band-pass filter (U1D). The operational amplifier U1A is employed to stabilize a reference point called “internal ground”. The internal ground concept is used here to give separated internal ground reference, different from external ground reference. As you can see in the schematic diagram, there are two types of ground symbol, first is the internal ground symbol with horizontal strips (connected to the output of U1A), and the second is the external ground symbol with diagonal strips (connected to power supply, input, and output grounds). Please beware of this separation! The envelope detector function is provided by the circuit around U1B, which can be separated into rectifier and filter parts. The rectifier part is a modification of precise full-wave rectifier circuit from reference , consist of U1B, C5, C6, VR1, R4, R5, and D1. At the negative cycle of the input, the output of the op-amp will be positive and the D1 diode will conduct to give an output which is fed back to the inverting input through R5, giving the exact copy of the mirrored input at the D1 output since the gain is unity (R4=R5). At the positive cycle of the input signal, the op-amp output becomes negative and D1 will be disconnected, so the input will directly be routed to the output (the connection between D1 and R6) through R4 and R5. Because of the loading effect of R6 and R7, this cycle will be about 9% lower than the opposite cycle (when the op-amp actively drives the D1 diode), but it’s fine for this function. The filter part consist of R6, R7, and C8, smooth out the ripple to give a smooth envelope profile. Without amplification, the envelope signal ar C8 capacitor has very low amplitude and very weak power, not ready to drive a LED (light emitting diode). Op-amp U1C provides amplification and buffering, driving D2 LED through R10 resistor. The gain of this amplifier is (R8+R9)/R8, giving amplification factor of 22.3 using the selected R8 and R8 values. 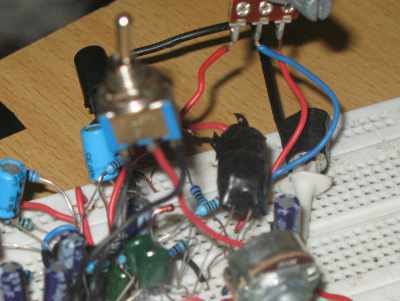 You can increase R9 to 470K or decrease R8 to 1K to widen the frequency sweeping range adjustment by VR1 potentiometer. The frequency offset adjustment is given by VR2 potentiometer, wide enough to accommodate wide range sound color from bass to lead guitars. Some experiments using different type of LEDs and LDRs give different result, but as long as they give resistance sweep from 100k to 2k inside the current range between 0-20 mA then we can use them. The LED and LDR should be tied face-to-face closely together, seal it with dark insulation tape to prevent ambient light leakage.